I have had adventures! 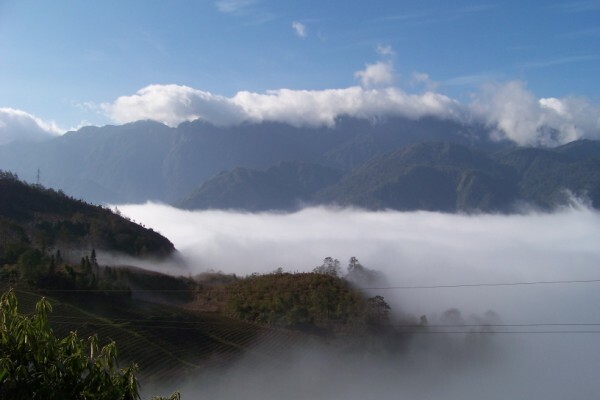 At the start of the month I went to North Vietnam. 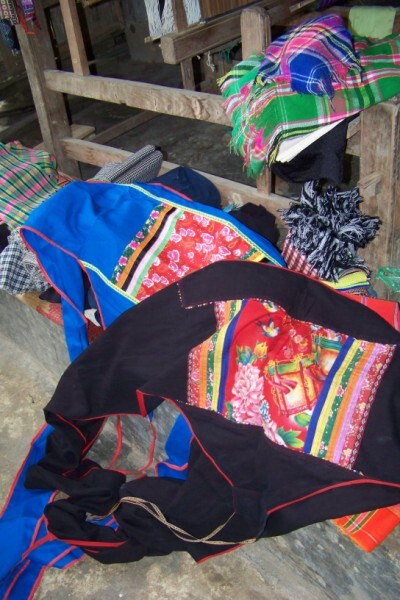 For the first 10 days I went on a textile tour to the minority groups north west of Hanoi organised by Serena Harrigan (Textile Odyssey: http://www.textileodyssey.com) It was a small group of 6 including Serena with the services of a driver and interpreter. Following the tour, my USA friend, Deb McClintock, who had also been on the tour and I organised a trip west of Hanoi through the same services of Discovery Indochina (www.discoveryindochina.com) that Serena had used. We had the same interpreter that we’d had on the previous trip and I can’t speak highly enough of his enthusiasm, knowledge and willingness. If ever I was going back to Vietnam I would certainly use this company. Rather than give a diary of what we did, I will report on the textiles, focusing on looms and what was woven for which group. 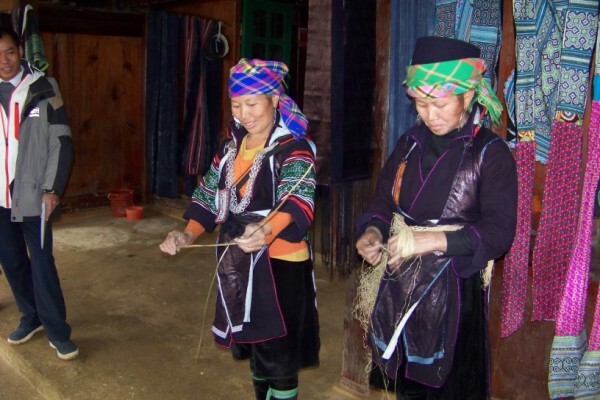 Loom of Pathen minority group, Tan Trinh village. We visited a school where a group of weavers were currently weaving a head scarf. 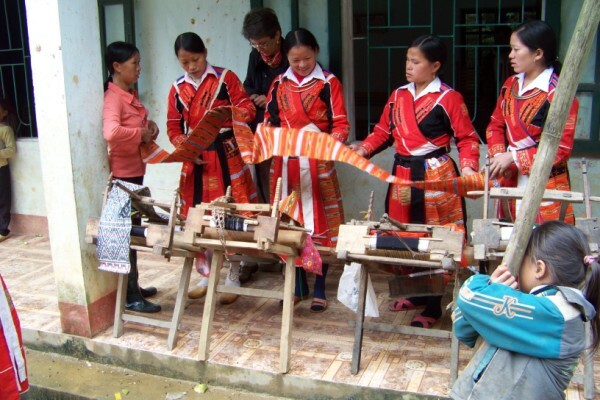 It was exciting to see a school where weaving tradition was being taught. 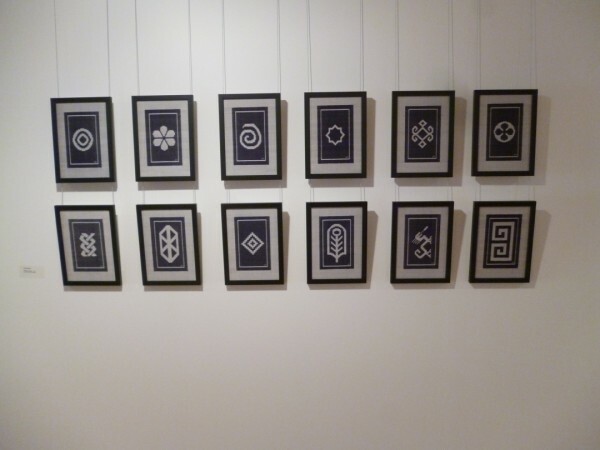 Initially I wondered at the fact that everyone was weaving exactly the same sequence. It was interesting to note that as the trip progressed, it was clearly evident that it was the norm for people to have what was in essence a “uniform”. 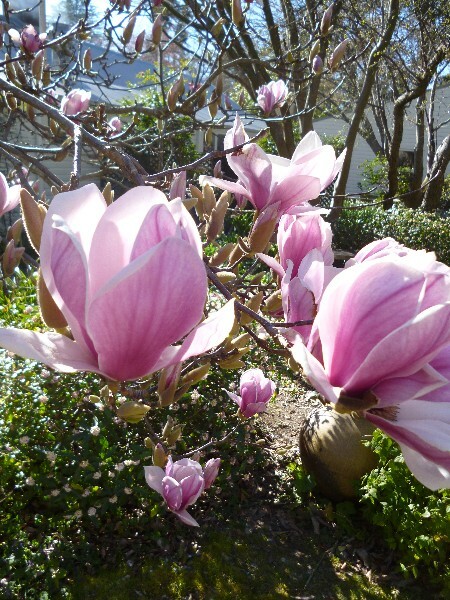 The “unifiorm” may have minor variations but an initial impression was that everyone was dressed the same. Back strap loom on frame. 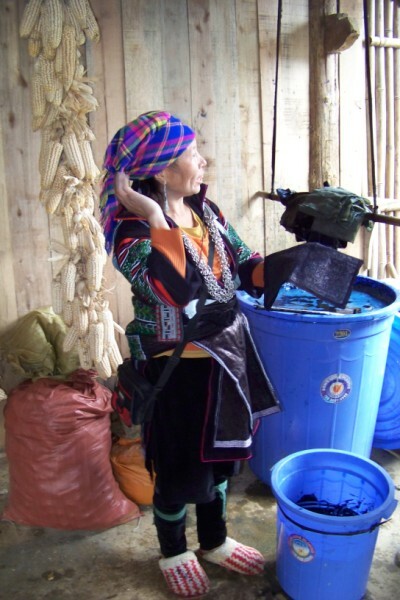 The warp passes over a bamboo pipe to provide one shed. 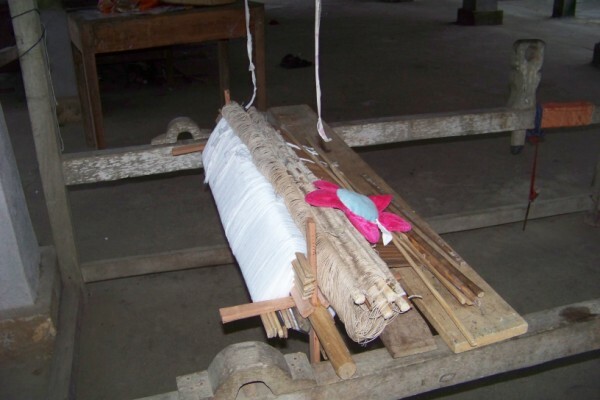 The alternative threads are on string heddles supported on a bamboo stick. The bamboo pipe is also used for storage. This loom has an interesting mechanism for lifting the alternate heddle shed. 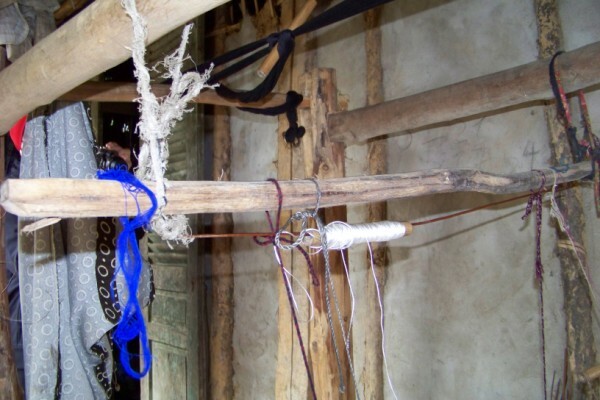 The shaft is tied to an arm that is part of a structure mounted at the back of the loom that pivots. This is then tied to the weaver’s foot. To lift the shed, the weaver moves her foot back. 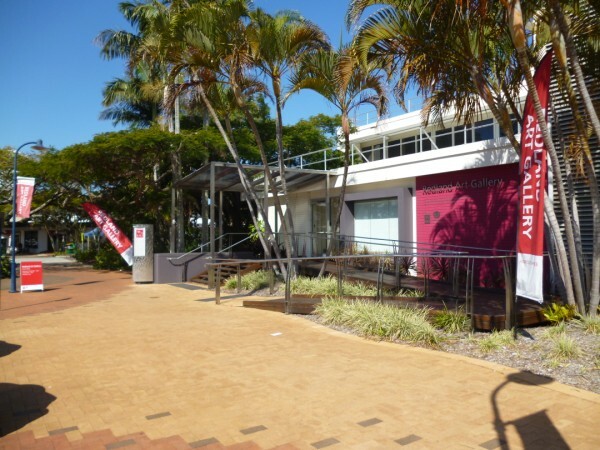 This structure is not always present. If the weaver is doing plain weave then it is used. If she is doing a section of brocade it isn’t mounted. 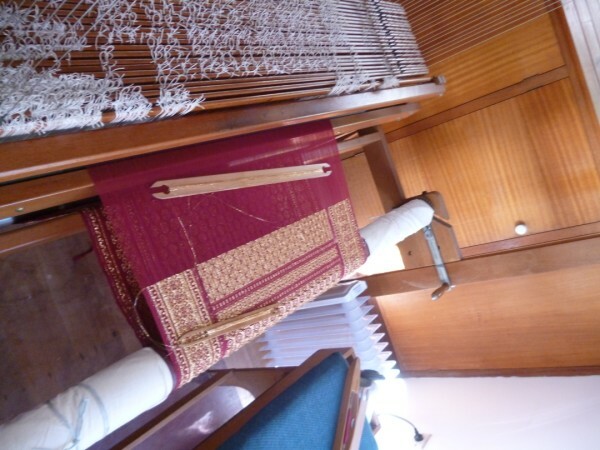 The loom can be picked up and moved easily. 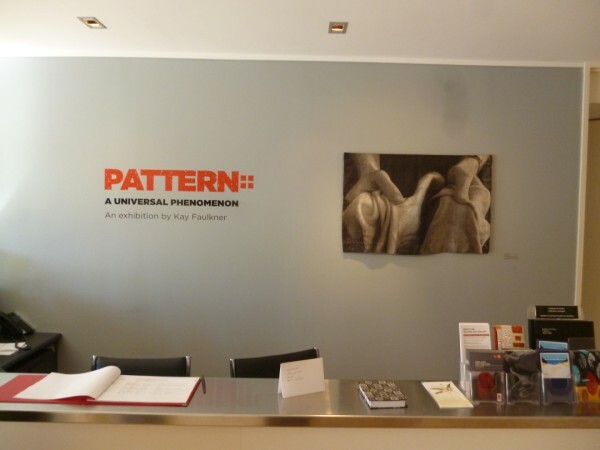 We did not see any method of storing the supplementary weft pattern. Each row was individually picked up. Fabric woven: plain weave with supplementary weft both continuous and brocade. This was a very useful tool used for both supplementary techniques. The fine warp and weft looked like polyester overlocking thread (either black or white was being used) with the heavier thread being acrylic. 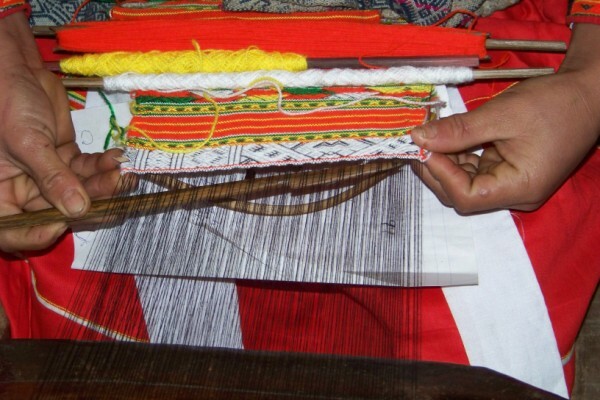 The weavers refer to a pre- existing fabric to follow the pattern. Note the use of a temple which is suspended under the fabric out of the way of the brocading. Variations of the scarf fabric are also pieced into the costume. 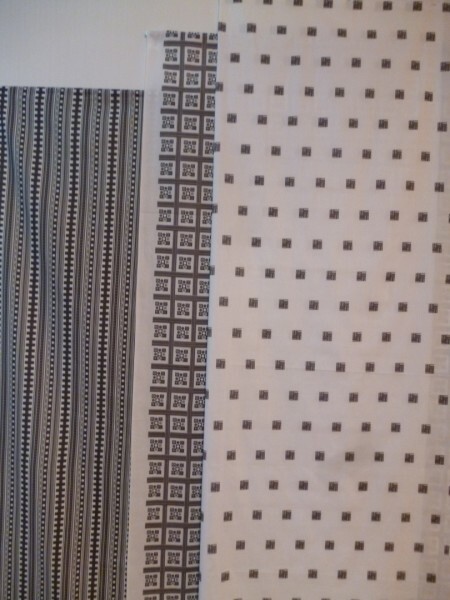 In all the examples I measured, the weaving width was 19 cm. 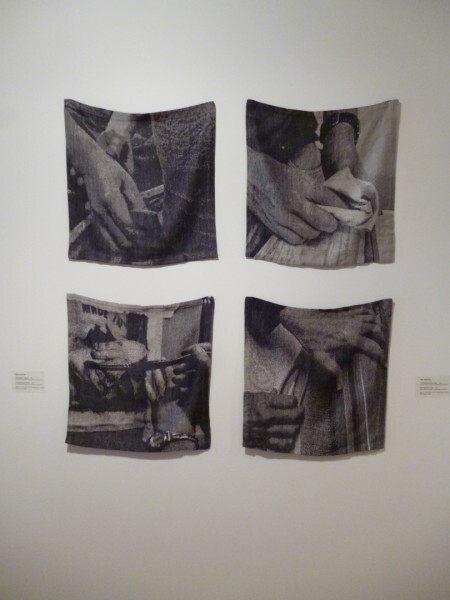 The scarf (not put on) is folded so that the outside edges are inside to a width of 6 cm. 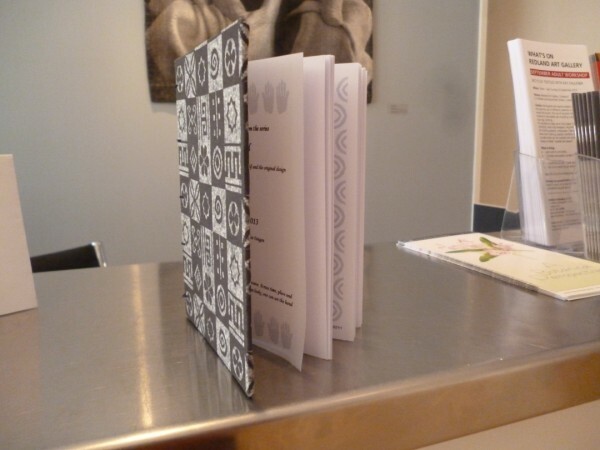 The edges are tacked together. 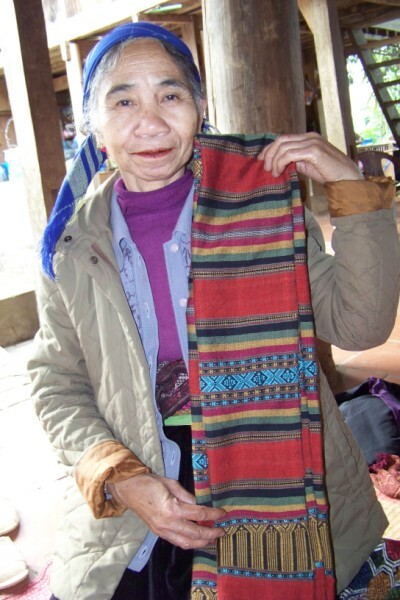 The length of the scarf is 250 cm with brightly striped sections including supplementary weft pattern and brocade (similar to what was being woven) of 68 cm at both ends and a centre section of pick up supplementary weft in one colour. 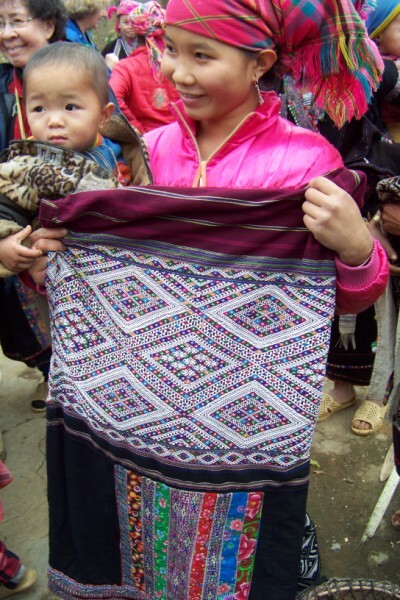 Black Hmong. At this village we had a demonstration of the entire process from spinning to dyeing the batik hand woven fabric. Here is an overview. This was an interesting breaking system and we saw other variations of this on most looms. The back beam has spokes. A bar slides forwards to allow the beam to move and then is pushed back to stop. 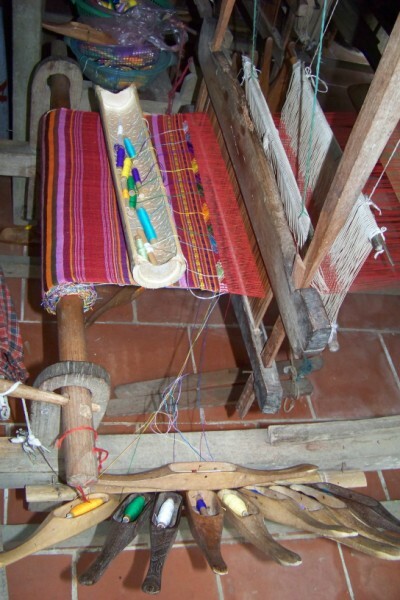 The weaver has a slot on the front beam into which a peg is inserted to keep the warp tight. Only plain weave was being woven so two shafts only are required. Batik may be done. Bees wax is used. Fabric is dyed in indigo. Leave in indigo for 1 or 3 minutes to start, remove allow to nearly dry 3 times per day. Then extended to 2 hours dip per day for 3 months. The fabric is extremely dark. 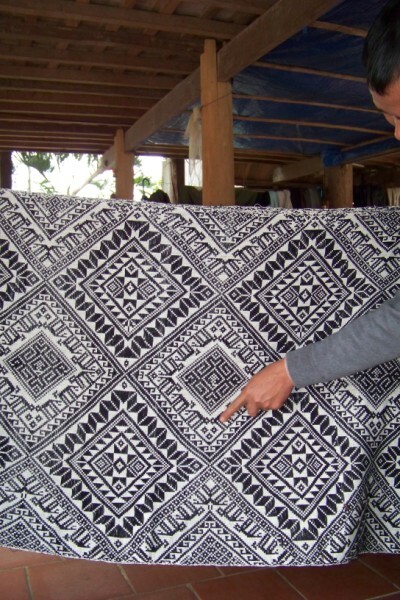 The batik’s dye process is ‘only’ for 1 month and is for approximately a total of 120 dips. Calendering the fabric produces shiny metallic cloth. 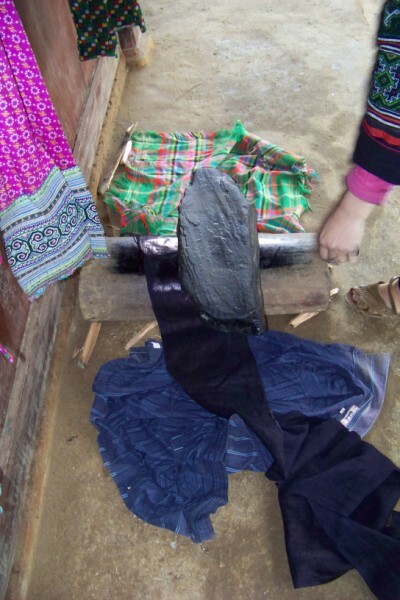 Bee’s wax is applied to both the cloth and the underside of the rock. The dyer stands on the rock and works the rock over the fabric exposed on the pole polishing the surface. 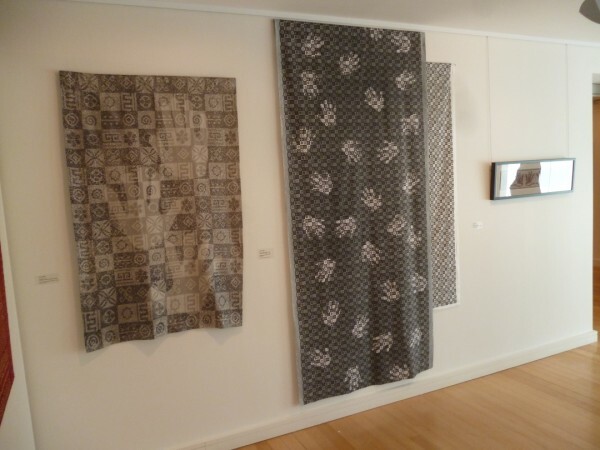 The batik fabric produced is pieced into garments and may be combined with embroidery. The calendered fabric is used for sections of the jacket and apron. We were told that after 3 washes it reverts to the unpolished state. 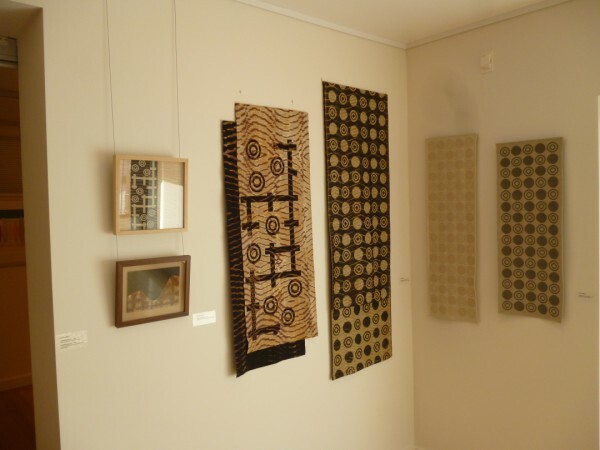 Some of the previous images show examples of garments and textiles with both batik and calendered cloth. 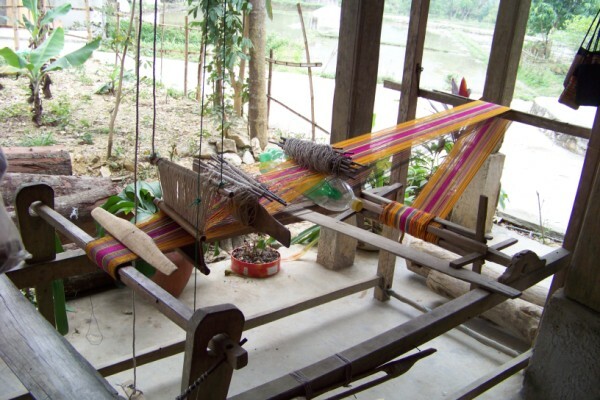 The loom of the Tay found in Ban Ho village and in the foyer of the Sapa Hotel. 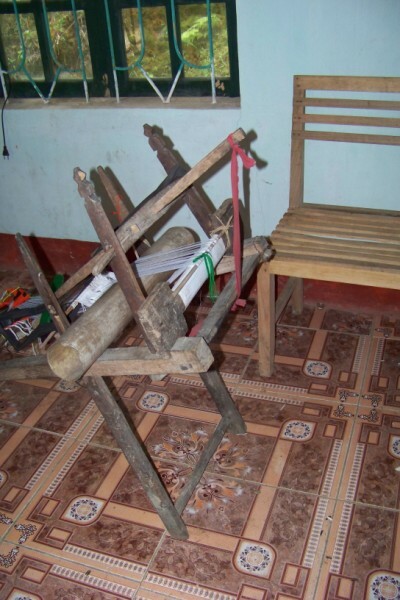 This loom is similar loom to that in the Black Hmong. Stripes and checks in acrylic yarns were commonly being woven. These scarves were for the tourist market and were being woven on the loom in the hotel foyer. Note the spokes on the warp storage beam and the bar that is moved to advance the warp. 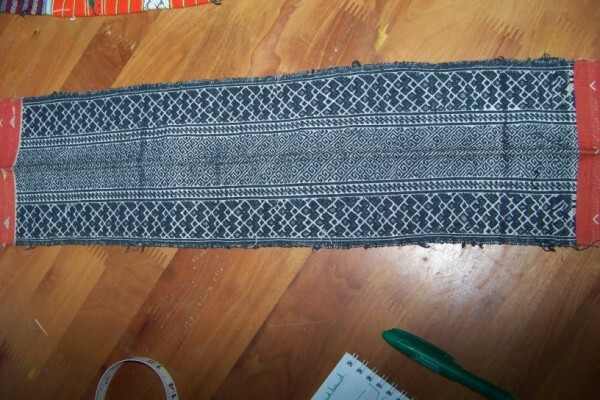 Once the warp has been loosened, the cloth beam is advanced. The peg is inserted into the beam and fine tuning of tension achieved by winding the cord around the peg; a very simple and effective mechanism. 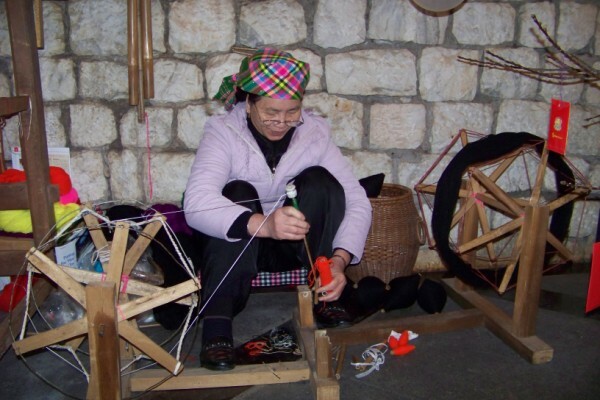 Winding spools of yarn for both weaving and warping from a skein. Variations were seen from the primitive to this more refined version. Note the bamboo bobbins. Winding a warp. 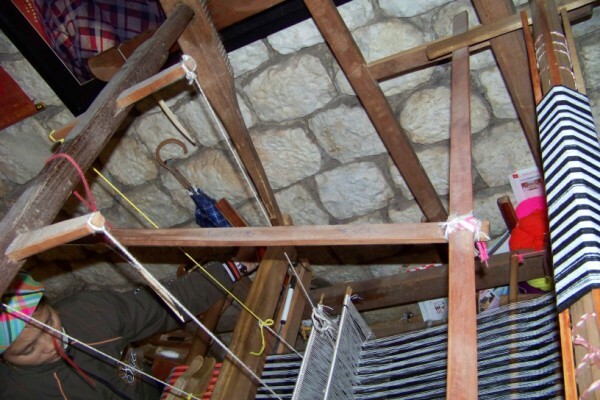 Bobbins were placed on this rack and walked around the posts under the house to obtain the appropriate warp length. This weaver had a number of cloths for sale. 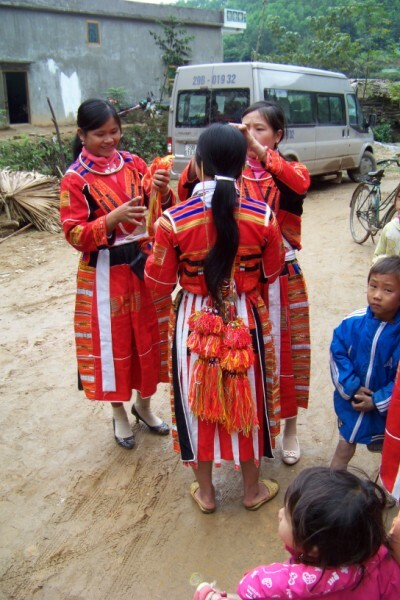 They were also sold to other groups as well as within their ethnic minority. 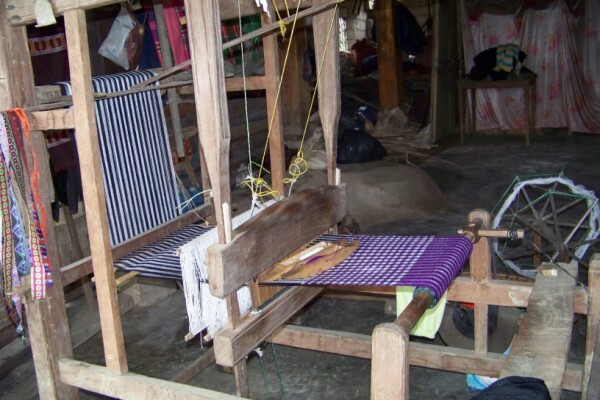 The cloths that were potentially woven on this loom were all plain weave. They included head scarves (usually in acrylic). I bought some plain weave cotton and hemp yardage. 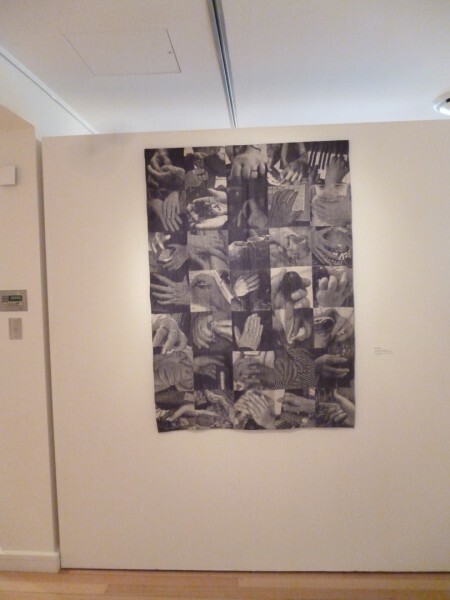 The cotton was quite stiff. The weaver showed me the singles cotton yarn that she was using. It was quite softly spun. She had sized it with rice water. “After cleaning rice, pour off the water”. This water was then boiled to reduce. It was the washing water that was used and not the water that the rice was cooked in. The cotton was then sized in this bath. 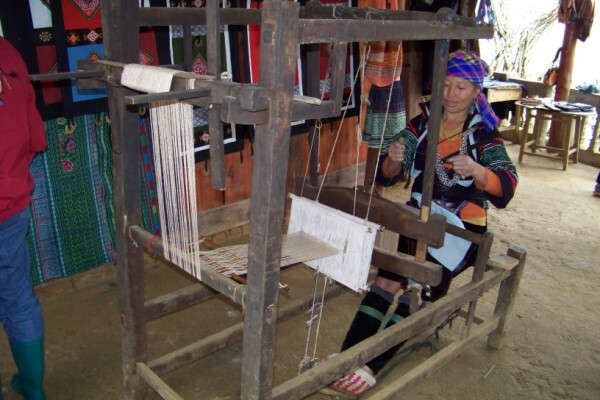 The loom of the Lao (others may call them Lu) of the Na Tam village. The looms here were used to weave patterned fabric with quite complicated supplementary weft patterning including some brocade. The frame is quite rough in construction. This one was made by the husband. 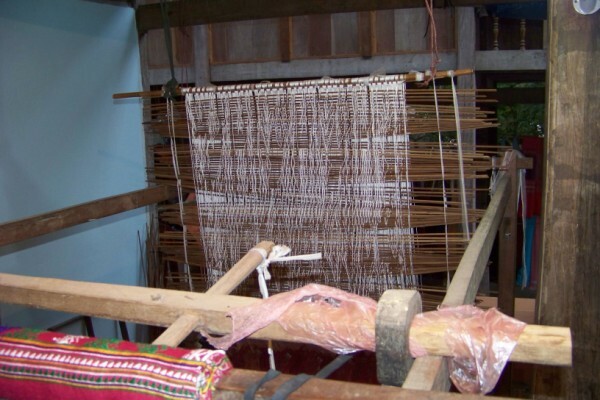 The warp passes over the top of the loom and is knotted above the weaver’s head. To advance the warp, the knot is loosened and then reknotted. The ground is 2 shafts . 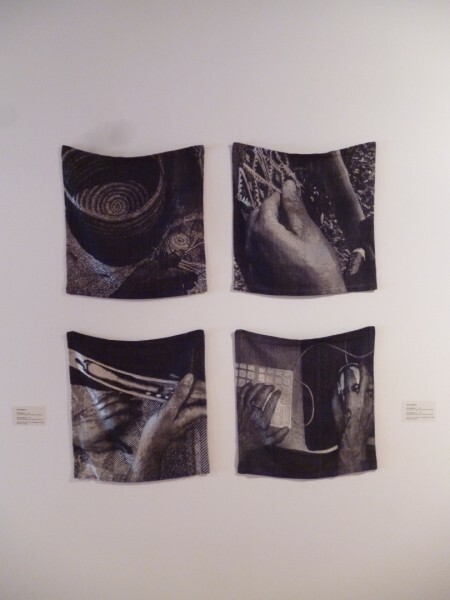 Note the series of bamboo sticks that record the weaving pattern. The fine black thread used for both warp and weft looks like a polyester overlocking thread. 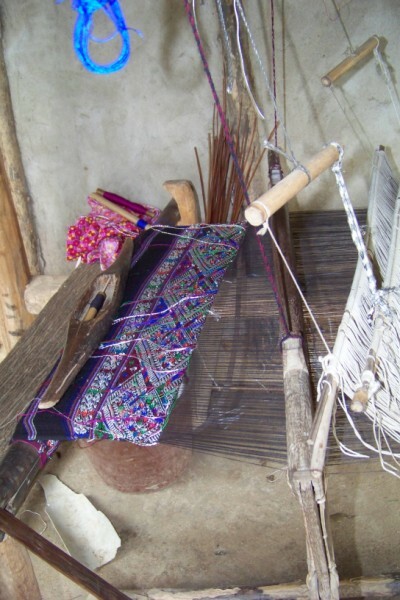 The weft brocade is “silk”. 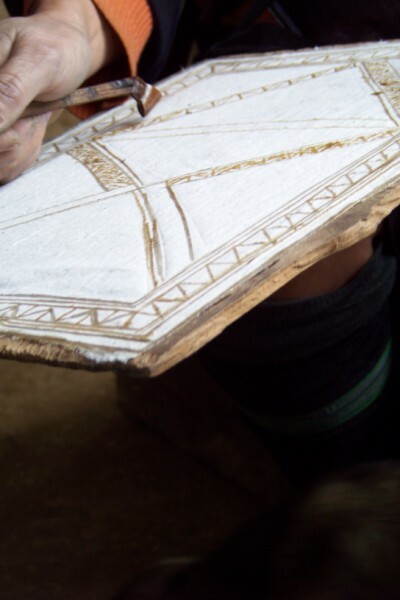 Note that each colour has a separate thread for the inlay. 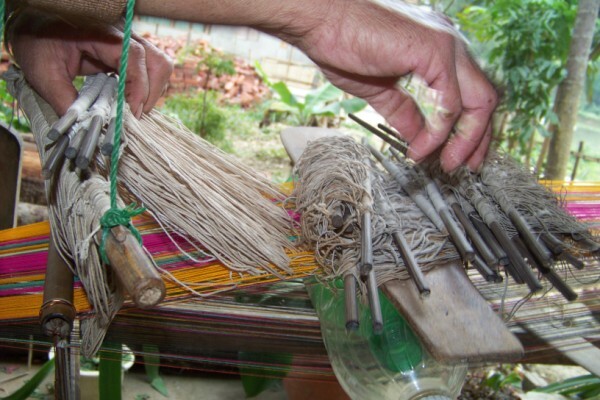 The weaver picks up the pattern, weaves the row then transfers that pick up to a stick at the back of the loom. The greater the number of pattern rows, the greater the number of sticks that are transferred to the back of the loom. 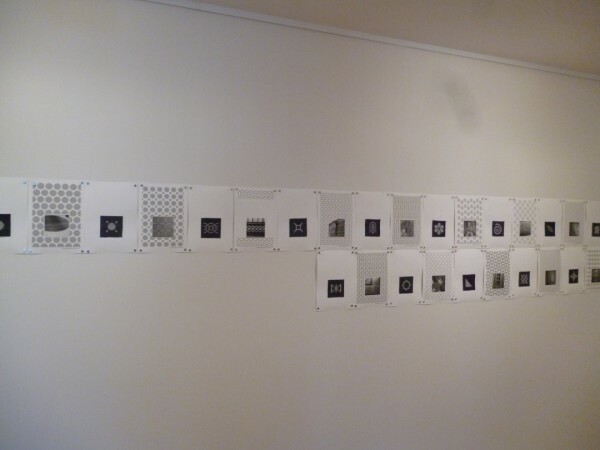 This stored information is then used to weave the mirror image thus resulting in the weaver having to do only 1 pickup sequence for a mirrored repeat. The stored information can only be used once. 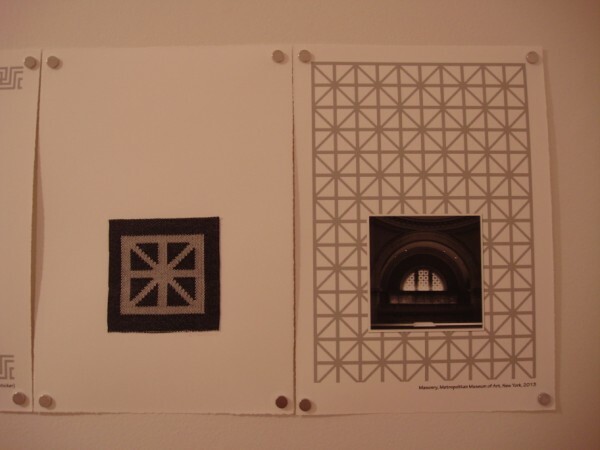 To complete another sequence, the weave has to repeat the process. Skirt showing combination of brocaded fabric combined with ribbons of both commercial and handwoven fabric. 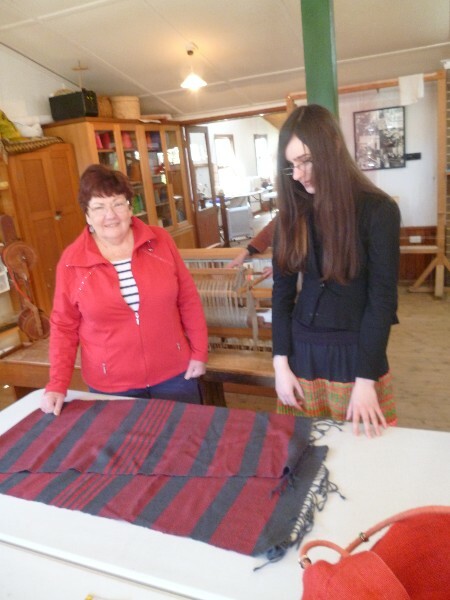 We saw this striped and brocaded patterned fabric being woven that was later cut up for the ribbons used as decorative trims in the skirts and jackets. 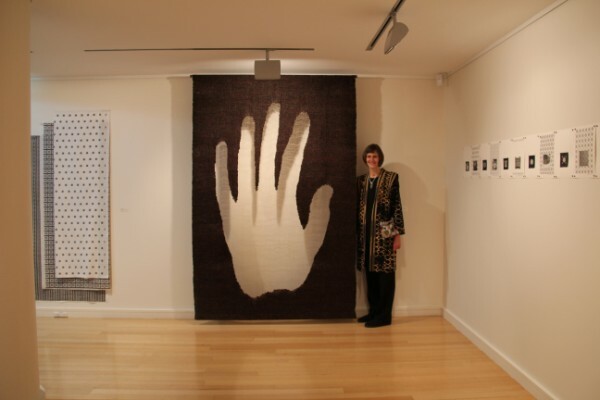 The blankets were woven with cotton/polyester background and an acrylic supplementary weft. Both of the following looms were being used in the same area. 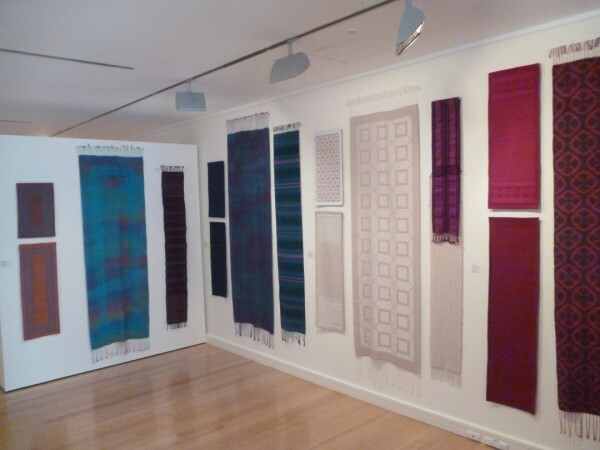 The Thai were weaving brocade/supplementary weft fabrics while the Hmong were weaving warp manipulation and supplementary warp. 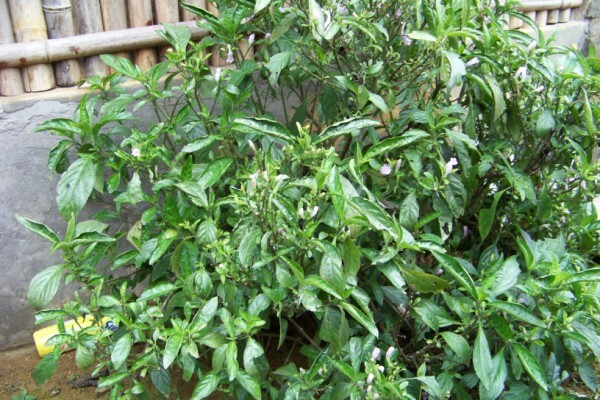 These were seen on Deb’s and my trip to the Hoa Binh Province west of Hanoi. Warp wound and string heddles threaded. Once the warp is on the loom, bundles of warps (in this case 4 ends) are grouped onto the vertical structure. 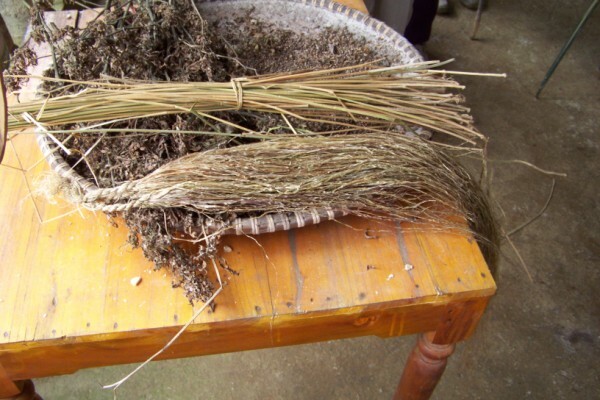 These bundles will be manipulated to achieve a method of remembering the pattern to be repeated during weaving. Once it has been picked up the pattern is transferred onto the vertical storage device at the front. 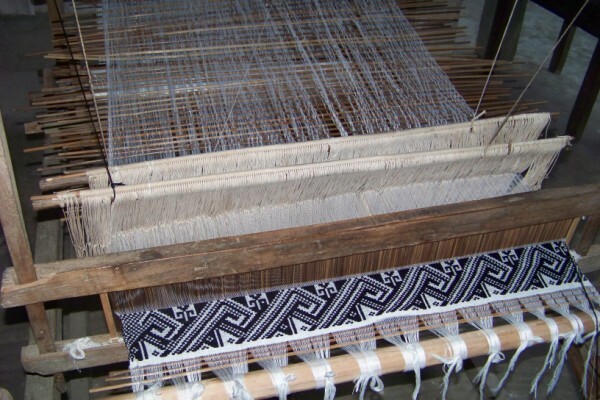 To weave the pattern from the front of the storage device is transferred to the warp behind the heddles and at the same time moved to the back. 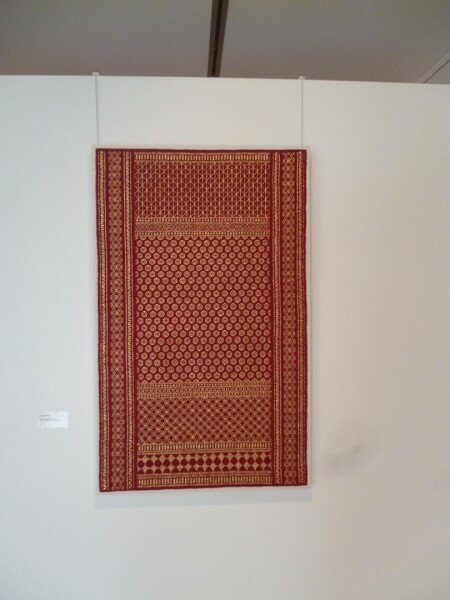 In this way there will never be a need to re pick up the design as was the case with the Lao loom. I was very taken with this tool to hold the shuttles. Without this it would be very difficult to stop the weft yarns tangling. Bobbins for brocade were often wound on bamboo. They may be stored in a length of bamboo cut in half lengthwise. 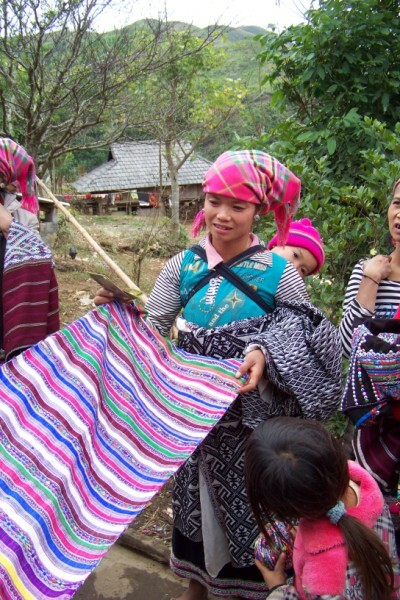 These scarves were being woven for the tourist market. 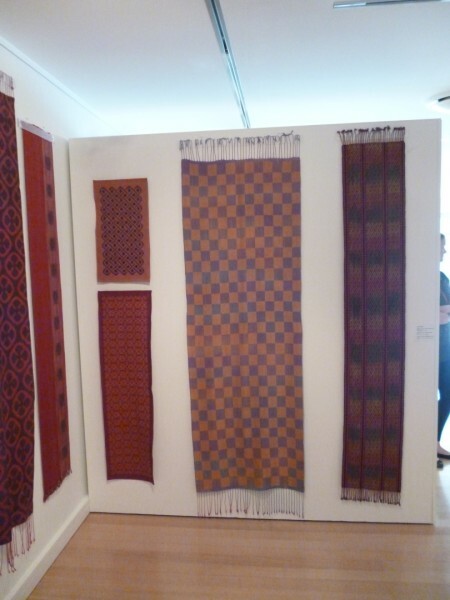 We were however very fortunate to be shown traditional textiles from this weaver’s collection. The grandmother is now 66 and she started weaving at 12. 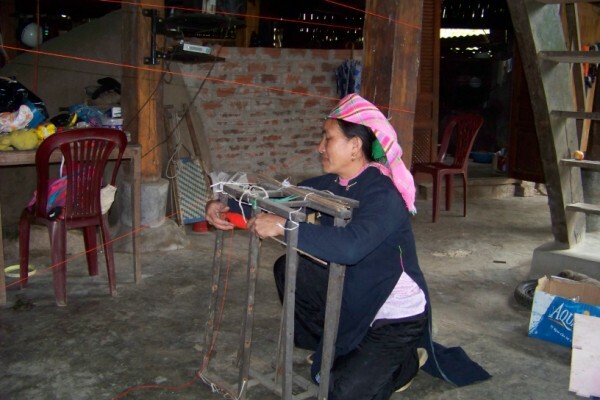 We saw 2 daughters who were extremely skilled weavers. This traditional cloth incorporates symbolism representing monkey, flower and fruit. It requires 72 bamboos or pattern rows in half a mirror repeat. Indigo dyed, homespun cotton. 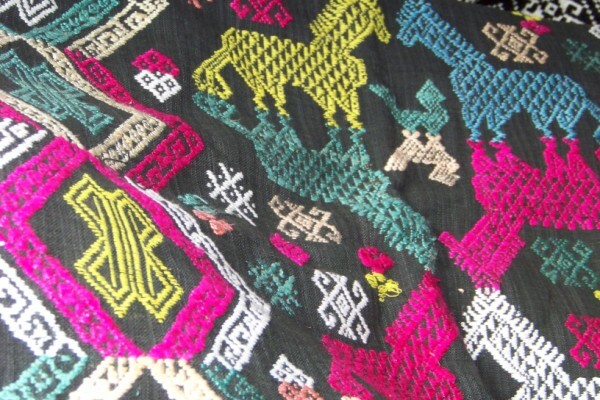 Horse and saddle motif in silk brocade. 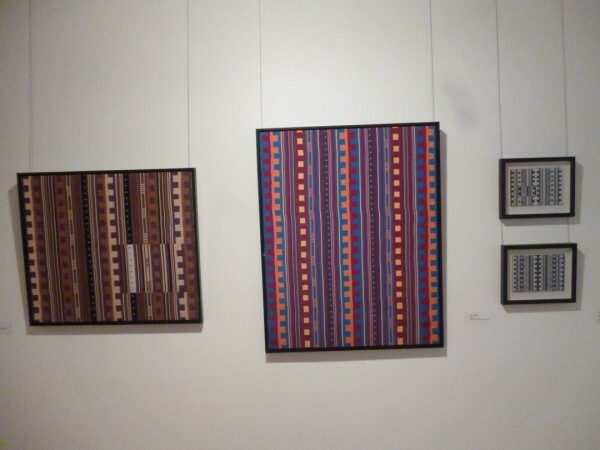 Each pattern row has several bobbins of colour. There are 140 bamboos or pattern rows in half a mirror repeat. 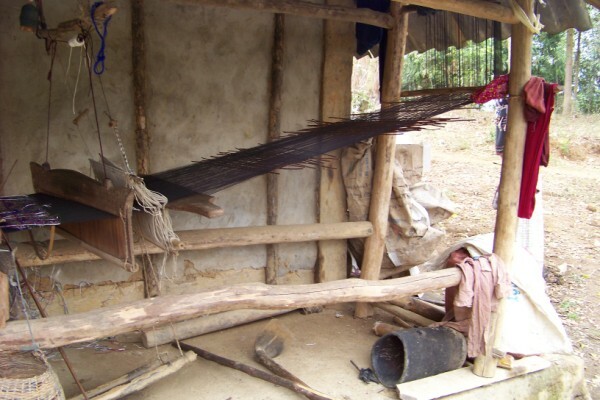 Loom of the Hmong used to weave warp manipulation fabrics. The beater that was used on this loom was combined with a shuttle. Rather than being flat underneath it had a pointed edge, thereby allowing the weft to be beaten in at the same time that the weft was inserted. It certainly saved time by the total process not requiring 2 pieces of equipment. In combination with a plain weave row which is lifted by the shafts using a counterbalance action, each row requires a lift of a pattern shaft. The only pattern that I saw being woven in this technique was of a dragon. 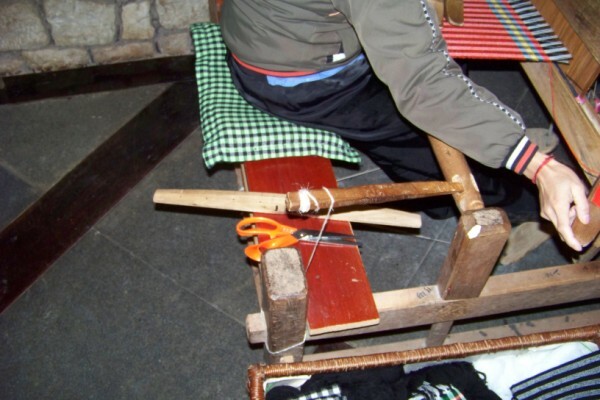 In fact this loom was referred to as a dragon loom. 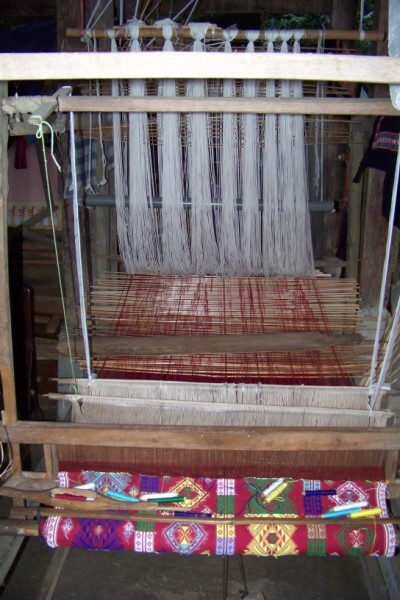 The technique requires the manipulation of the warp resulting in bringing warp threads into the opposing shed. 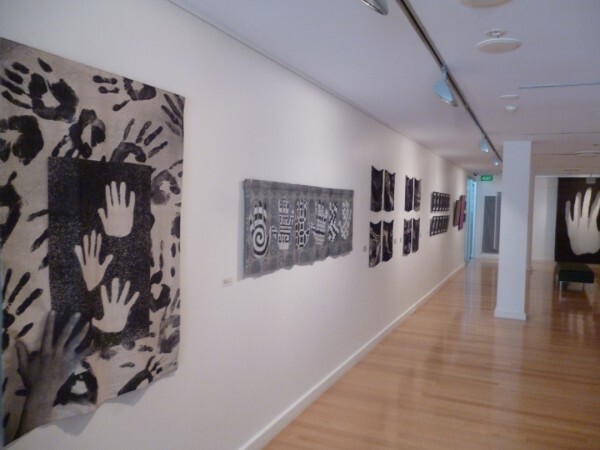 The fabric is warp faced and utilises colour sequencing. 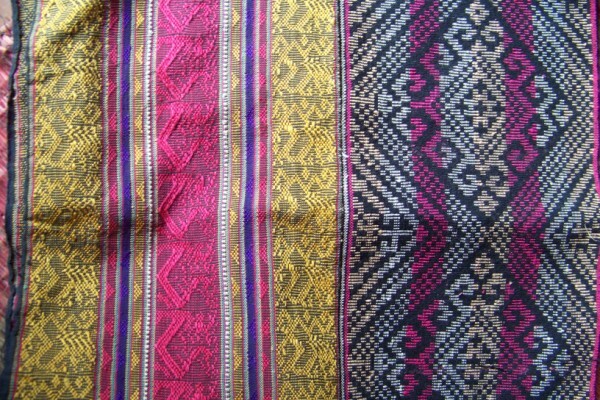 These two fabrics were combined in the top of the Hmong Muong costume. One is the dragon fabric the other is a supplementary warp fabric. There are long floats on the reverse of this fabric. The colour is in the supplementary warp on a black, plain weave, warp faced fabric. They could both be woven on this loom. I have however 2 regrets. The first is that I didn’t get that silk yarn when I saw it. The other is that due to the weather (rain, fog, mist and possibly even smog) we saw very little scenery. We did have 30 minutes of fine weather when we were above the cloud. 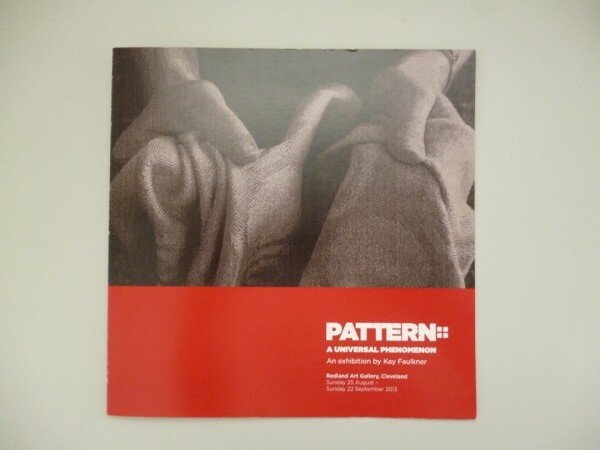 You are currently browsing the archives for the Textiles of North Vietnam category.